Mumbai: From his first solo exhibition in 1960 to the present day, Gulammohammed Sheikh, a recipient of the Government of India’s prestigious Padma Shri award for his contributions to the arts, has become a major contributor to the world of Indian art. 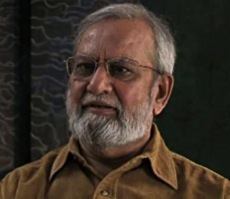 As an active artist, poet, critic and professor, Sheikh has encouraged the development of the arts in India in myriad ways, including his critically acclaimed collection of surrealistic poems ‘Athwa’, his theorizing of the narrative-figurative tendency in contemporary Indian art, and over three decades of teaching art history and painting. In a series of seventy videos on Web of Stories, an online archive of thousands of autobiographical video-stories, Gulammohammed Sheikh weaves together personal anecdotes, ruminations, and influences, to share with his viewers the unique vantage point from which he views the art world. In his video on developing his own work and the artists David Hockney, and R.B. Kitaj, Sheikh speaks of his time at the Royal College of Art in London (from where he graduated with an MFA in 1966). Entering the RCA just as Hockney and Kitaj graduated, Sheikh talks about dealing with an artistic cul-de-sac at a time where London was buzzing with stories of Hockney and his artistic endeavors. While he remembers enjoying Hockney’s works, Sheikh describes an immediate affinity with Kitaj’s works, from which he derived inspiration to experiment with collages and which he compares to Godard. The other videos in the series, also recorded in 2008 as conversations with the British artist Timothy Hyman, describe Sheikh’s life and work from his earliest years to the latest monograph published on his life.